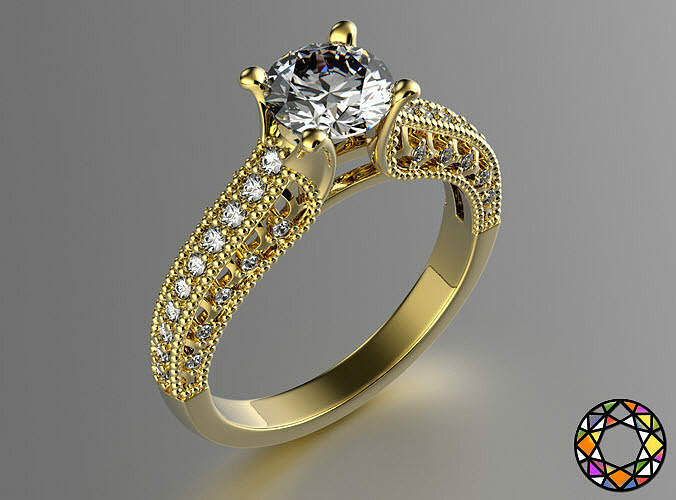 Print Ready 3D Model Engagement ring 3D model of engagement ring with white or yellow gold. stl mesh 290750 points. 582188 triangles. size Ring size USA 8.0 / 17.8 mm D.
Center Diamond Round - 0.125 ct / 3.25 x 3.25 mm D.
rounds 20 pieces (0.08 ct)/1.0 x 1.0 mm D. rounds 12 pieces (0.096 ct)/1.25 x 1.25 mm D. rounds 8 pieces (0.104 ct)/1.5 x 1.5 mm D.
weight 14 ct gold - 4.5 grams. Model avalible in STL format for prototyping. geometry is healed, and fixed all the bad with RP Magics software (*.mgx file included). Model is ready for prototyping on CNC and 3D Printing.